To bridge a height difference you can make a staircase in wood, masonry or concrete. From one level to another building a solid construction is desirable to minimize possible accidents. If you have a map or plan drawn the vertical direction of the stairs is indicated with an arrow: downward nothing (or a ball), and up the arrowhead. So also is the staircase that rises from the basement to the ground floor drawn on the plan of the basement. Downstairs and upstairs you foresee at least 1 meter step and exit area (landing). Keep in your plan into account the thickness of the possible coverings of floors (above and below) and the (concrete) occurred. The horizontal distance between the start of two successive steps is called the tread (depth 17-25 cm). The vertical distance between the top sides of two successive steps is called the riser (height, 15-22 (typically 18) cm). A staircase without risers (seal between steps) is called an open staircase. The classic tread riser formula: 2 × 1 × riser + tread = (570 à) 630 mm. The riser must be equally high everywhere. In private dwellings (British standard) they may be more (22 cm) than in public buildings (17 cm), resulting in a slope of 42° to 33°. For a main staircase in a building is a slope between 36 and 38° used. A slope of 25 to 30° shows to ask the least energy (to climb). The ratio of 17 x 29 cm was the most effective in accordance with the ratio formula (2xO = A + 1x 63 cm). In the Netherlands, the minimum width, the height of the riser, the headroom above the stage, the size of the tread at the location of the climbing line measured perpendicular to the front of the step and the location of the climbing line is mentioned in tables in the Building records. Another reason to make stairs deep and high enough: if you get trouble later walking stages you can make with solid blocks of half-height on one side mounting intermediate steps. The balcony is a platform where two flights of stairs or a ladder interrupt and where stairs change direction. After about eighteen treads usually an intermediate landing is provided. The headroom above the stairs is 2.10 m from the nose of the step. A handrail is placed above the step height on 80 cm, and runs still 30 - 50cm from above / below the last step. On the landing and horizontal zones, the height is 1 meter. For aesthetic reasons is often opted for an equal height of 90 cm in all places. Where there is danger of falling more than 6 m altitude there is a high parapet of 120 cm. The ideal step width for one person is 90 cm. 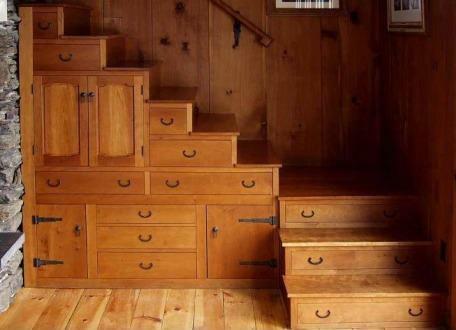 Service stairs (attic, basement) which are not often used can be to 70 cm wide as they are free standing on one side. Contrast marking on the first and the last step of the staircase is desirable, as slip-resistant material (or slots) on the stairs. I just felled off a ladder of 7 meters. Fortunately from the bottom rung. Ladders come in many sizes and types. The mutual distance for rungs is > 22.5 cm. and < 30.0 cm. The rungs are motionless stuck between the side rails. The length of the rungs, between the rails, must be at least 33 cm and 66 cm. The angle formed between the ground and the ladder must be 75°. The overlapping of two ladder sections must be 1 meter. Make sure they are on a stable and solid surface. Make them if possible fixed, so that they cannot fall or shift. Never climb the last three sports! The working width is limited to about 1.5 meters. Keep your center of gravity always between the uprights of the ladder. Material you carry up in a belt or in a shoulder bag, so you have two hands free for climbing.